The long case grandfather floor clock, standing between six and eight feet tall, is commonly know as a Grandfather Clock, but is technically known as a Long Case Clock, a descriptive name, as the clock’s mechanism – driven by a falling weight, and regulated by a swinging pendulum – is placed within a long narrow case. Around 1660, long case floor clocks evolved from the early weight driven “Lantern-Bracket” clocks which were hung on a wall bracket to provide space underneath for the weights to drop. Enclosing the clock movement within a long (or tall) narrow case to accommodate the dropping weights, enabled the clock to be removed from the wall, and the floor-standing or freestanding clock was born. Generally, these early clocks’ cases were plain wooded boxes with a wood door. This type of clock – in a tall wood container, resembled a coffin in many people’s eyes, and “coffin clock” is what some called them, along side the term “long case clock”. At this time, behind the door of these freestanding floor clocks was a short pendulum, producing a poor level of accuracy. Clock movements then used a verge escapement mechanism that needed a wide pendulum swing of around 90°, and a pendulum with such wide swings, could not be fitted inside a case. For this reason, although it was know that the longer pendulums were more accurate; it was not until the invention of the anchor escapement mechanism – by Robert Hook circa 1670, which shortened the pendulum’s swing to around 5° that clock makers were able to incorporate long pendulums into their long case clocks, which although narrow, accommodated them easily. The longer pendulum not only improved the clock’s accuracy, it produced a slower “beat” and so used less power. This enabled clocks to run for longer periods, which in turn caused less friction between the component parts of the movement, reducing wear and extending the clock’s life. William Clement is acknowledged as creating the first long case clock, as we would recognise it today – with a long pendulum, in England around 1680. A decade after the anchor escapement mechanism was invented; and he in fact disputed credit for it with Robert Hooke. Within the year, the concept was adopted by Britain’s most prominent clock maker Thomas Tompion, and was quickly taken up by others. Almost all long case clocks today use a “seconds pendulum” meaning that each swing from left to right (or right to left) takes one second of time. So a full swing starting and finishing at the same point (the period) takes two seconds. These pendulums are about a metre (39 inches) long – to the centre of the pendulum bob. Further improvements in the accuracy of modern clock movements is achieved using a more precise variation of the anchor escapement – called the deadbeat escapement, which is manufacturer to tighter tolerances than its predecessor, reducing friction and recoil against the escape wheel, allowing the pendulum to swing more freely. While the technical term for the Floor Clock is a “Long Case Clock”, which is still relevant in the 21st century – reflecting the clocks design; most people refer to these clocks as grandfather clocks (the reason – read on!). As indicated above, the height of a long case grandfather floor clock arises from housing a long pendulum and set of dropping weights driving the clock’s movement. Traditionally, long case grandfather clocks were made with two types of movement: an eight-day that requires winding only once a week and one-day (30-hour) movements, which has to be wound every day. 30-hour clocks usually have a single weight to drive both the timekeeping and striking mechanisms. By contrast, eight-day movements are often driven by two weights – one for the pendulum and the second for the striking mechanism, which usually consisted of a bell ring or chimes – from hammers striking rods. These movements usually have two arbours (keyholes) on either side of the dial to wind each weight separately. All modern striking long case clocks have eight-day movements. Most of these clocks are cable-driven, which means that the weights are suspended by cables, each of which is wrapped around a pulley mounted above the respective weight. This arrangement doubles the running time allowed by a given weight drop. As the weights drop, unwinding each cable, they drive the movement, turning the clock hands and displaying the time and striking the bell/chimes. To keep the clock running the weights have to be raised again, building up potential power, by inserting a crank/key into arbours (holes) in the clock’s face and turning it. Not all grandfather floor clocks use cables; others are chain-driven, where the weights are suspended on one end of a chain that wraps around gears in the clock’s movement, with the other end of each chain hanging free at the side of the weight. In this design, to raise the weights and wind a chain-driven long case clock up, the free end of each chain is pulled, until the weights settle just under the clock’s face/dial. Around the beginning of the 20th century, 15 minute chime sequences were added to long case clocks. At a quarter past the hour, 1/4 of the chime sequence plays, at each half hour, 1/2 of the chime sequence then plays, and at the quarter to the hour, 3/4 of the chime sequence plays. Finally on each hour, a full chime sequence sounds, immediately followed by the hour strike: 1 for one o’clock, 2 for two o’clock etc. The most common chime tune used in long case clocks is Westminster chimes. Many movements offer alternative options, usually Whittington chimes or St. Michael’s chimes. The chosen tune is selected by use of a lever/switch mounted on the right side of the dial, which also includes a silence option if desired. As a result of adding chime sequences, many modern mechanical long case clocks have three weights instead of just two. The left weight provides power for the hour strike; the middle weight provides power for the clock’s pendulum and general timekeeping functions, while the right weight provides power for the quarter-hour chime sequences. An alternative to this is the power for the strike (left arbour) and the chimes (right arbour) are spring driven, where the spring unwinds over time and wound up again using the crank/key. The power for the clock’s pendulum and general timekeeping functions is provided by a single weight or a pair of weights together on a single yoke attached to the cable/chain. The long case grandfather floor clock come in a variety of styles, traditionally there is the French “Comtoise clock” distinguished by the use of curved lines and featuring a “potbellied” appearance with curved wider middle section, and a heavy elongated ornamented pendulum bob extending up the case. This style is also referred to as Morbier or Morez. From Denmark we have the “Bornholm clock” which often had a square-ish head with a crown, and on some a pointed decoration, as well as a window in each side, to view the movement within. Another variation has a bowed broken cornices and a third variation has large bowed cornices. The case is in three sections: head body and foot, normally with straight lines and always painted sometimes with motifs, and occasionally with simulated Chinese lakarbejde. 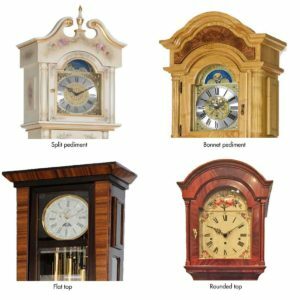 As well as the traditional styles, Grandfather Clocks today are manufacturer in two other broad categories: Contemporary – to sit in modern designed living and working environments, and Curio clocks, which can be designed for both classical and modern surrounding. The crown of the long case grandfather clock – the top, adds a great deal to the clock’s overall appearance and this aspect of design is incorporated in all three style categories mentioned above: contemporary, curio and traditional. ~ the “Rounded top”, a full circle sitting on a base or a half-circle integrated into the clock’s design. Whatever the style, all long case grandfather clocks are striking and inspirational pieces of furniture, some with intricate designs, other made with simplicity in mind, but all presenting a classy and grand look. 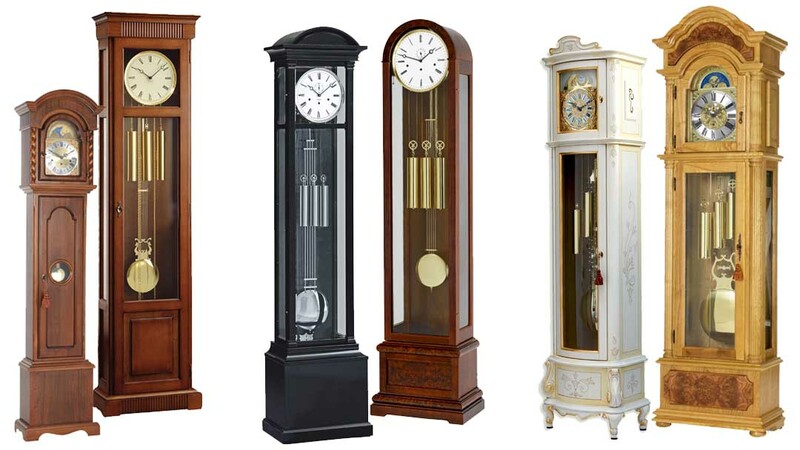 Grandfather clock, grandmother clock, and granddaughter clocks are terms that are all associated with long case floor clocks. There is no appreciable difference between them, apart from height. Grandfather clock are usually over 1.8 meters (6ft), while grandmother clocks are between 1.5 meters (5ft), and 1.8 meters (6ft), anything smaller than 1.5 meters (5ft) is classed as a granddaughter clock. Other elements that distinguish these clocks are, that grandmother clocks tend to be very slim, are spring driven, and have a domed top; along with a dial that is a maximum of eight inches in diameter. The majority of granddaughter clocks have round, electroplated silver dials with the numbers painted on, not engraved. So why is it called a Grandfather Clock? In 1876 an American visiting Great Britain, Henry Clay Work, stayed at the George Hotel in County Durham, England, where he found an old Long Case clock that no longer worked. When Henry asked about the clock he was told that it had always kept perfect time, which in an era when clocks were not so accurate as today, was quite unusual. However, when one of the brothers who owned the hotel died, the clock started losing time and could not be fixed. It then stopped altogether when the second brother died, aged ninety, and it was never repaired. Inspired by the story, Henry wrote a song based on it, which became hugely popular. In the song he referred to the long case clock as “Grandfather’s Clock” and afterwards people began calling all long case clocks, grandfather clocks. “My grandfather’s clock was too tall for the shelf, so it stood ninety years on the floor. It was taller by half than the old man himself, but it weighed not a penny weight more. It was bought on the morn on the day that he was born; it was always his treasure and pride. In watching its pendulum swing to and fro, many hours he had spent when a boy. And through childhood and manhood, the clock seemed to know and to share both his grief and his joy. For, it struck 24 when he entered at the door with a blooming and beautiful bride. My grandfather said that of those he could hire, not a servant so faithful he’d found. At it kept to its place, not a frown upon its face and its hands never hung by its side. It rang an alarm in the still of the night, an alarm that for years had been dumb. WHy not have a look at our selection of grandfather and Granmother clocks using the menu at the top of the page or this Floor Clocks link.